Zoodle Breakfast Nests – 6 Ingredients Only! Breakfast Zoodle Nests are a nutritional on the go breakfast & they pair perfectly with fresh fruit and a cup of coffee! It’s that time of the month again! When I read this theme I immediately thought of zoodles, probably just like many other Reduxers! I wanted to make something different with the zoodles though. I typically make a dinner item with them, so this time I tried breakfast! Zoodles are made when you take a fresh zucchini and spiralize them into…noodles! Many people like to use these as a pasta replacement. Why are my zoodles soggy? If serving zoodles raw, like in this Zucchini and Corn Salad, you won’t have an issue with soggy zoodles because heating up this vegetable is what causes the moisture to drain out. When you cook and bake with zoodles (like in this recipe), make sure to first pat excess water out of zoodles using paper towels! What am I supposed to use to spiralize my zucchini into zoodles? Can I make zoodles for meal prep? YOU BET! Make your zoodles and store in an air-tight container in the fridge. When you are ready to use them, take out your portions and make Low Carb Eggplant Parmesan with Zoodles or Walnut Pesto with Zoodles! How can I get my family to eat zoodles? Slowly start to introduce them to it. If your family is used to eat spaghetti with meat sauce. Try making the spaghetti 1/2 zoodles, and 1/2 regular spaghetti noodles! Also – season them up a bit! Use sauces or pestos to give them flavor! 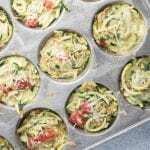 These Zoodle Breakfast Nests are a perfect on the go meal and have the fiber and protein to sustain you through the morning. They only took me 20 minutes to prep and 15 to cook – super simple! I used a little bit of breadcrumbs for a binding agent. I also think quinoa would also go well in these! Next time you make them try adding in 1/2 cup cooked quinoa for more of a nutritional punch. Breakfast has never tasted better...or been easier. 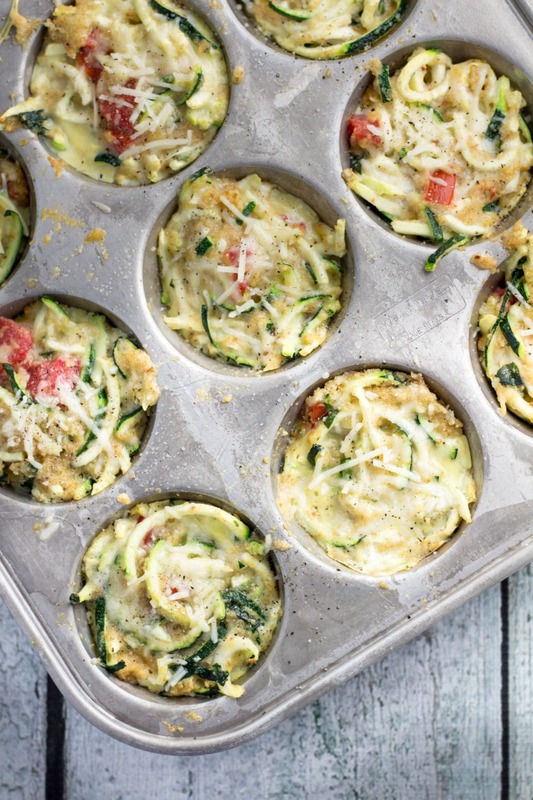 Prep your zoodles ahead of time to make this breakfast a perfect on-the-go meal! Spray muffin/cupcake tin with PAM. Spoon mixture into each cup and press down with back of the spoon. Top with additional Parmesan if desired. Cook for 15 minutes and enjoy warm! To prevent zoodles from getting soggy, pat zoodles with paper towels to remove excess water! YES!!! Such a great idea! Makes me feel like I need to invest in that spiralizer!!! Thank you! Yes yes yes, you won’t regret it! I’d never thought of using zoodles this way– what a great idea! Just curious how many this serves. Thanks! It makes 12 small bites, so perhaps 6-8 people 🙂 Enjoy! Just curious about the nutritional values, calories etc per each ? Hello! I’ve posted the nutrition label on the bottom of the post.